Summer is finally here. Whether you love laying under a big shade tree with a book in your hand, or prefer to do you reading at the beach, summer is the perfect time to catch up on all of the books you have been missing. To help out your summer reading list, Marissa from Rae Gun Ramblings and I have put together a giveaway with some of our favorites reads, perfect for a summer reading marathon. Among the books are Divergent, one of my all time favorite books, Cinder, a great story about a cyborg Cinderella and Grave Mercy which is full of Nun Assasins. It doesn’t get any better than that. Not only does the giveaway include 13 awesome books, but some awesome swag from the Rae Gun Etsy shop, including the fabulous Gryffindor Tie Necklace. I am in love with the Lunar Chronicles (Cinder, Scarlet) right now!! eeek I'm so excited we finally get to share this! I love me some Sarah Dessen for the summer, but I'm excited to read ALL of these! I want this! Favorite summer read? To kill A Mockingbird, hands down. But that's one of my favorites books in general! 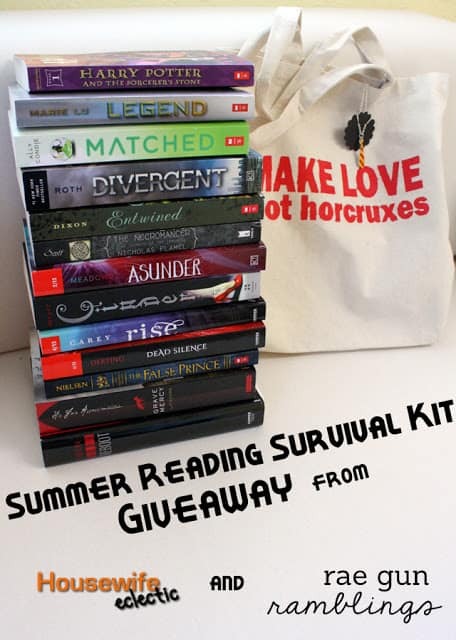 Oh my gosh oh my gosh oh my gosh, I am an avid reader and crazy lover of books and would LOOOOOVVVVEEEE to win this incredible giveaway! Crossing my fingers and my toes and my eyes! HA HA! I don't have a favorite summer read, but it's generally when I try and catch up! I'm totally looking for new reads to get me started! Sorry! Posted comment before clicking the rafflecopter. Dur. I've been reading the Unbreakable series (aliens, YES!) I just finished The Nightmare Affair and loved it. And the top 3 on my to-read are: The 5th Wave, In the Shadow of Blackbirds, and Quintana of Charyn (love all Marchetta) and this giveaway is EXCELLENT! love. What a great list! LOVE that book bag! Recently finished Cinder, so Scarlet is on my summer read list. Also on my list: finally finish the Matched trilogy that has been sitting on my shelf. Such a great list of fun summer reads!! I think I end up reading HP 1-7 every summer, just because. I've been so busy I haven't read anything in months! I'm excited to escape to the cabin with the kids and catch up! I NEED a collection of great books to read. This looks like THE place to start! Good luck to all who are entering! SO far my favorite summer read has been THE BOOK OF BROKEN HEARTS by Sarah Ockler — it's a story about a girl fixing up a motorcycle with her dad over the summer, and falling for a boy from a family she's sworn to have nothing to do with because two of the other boys have broken her older sister's hearts. It's a great family story with a sweet romance. I just finished a great summer read Cascade by Maryanne O'Hara. I highly recommend it! My Favorite summer read is ANNA AND THE FRENCH KISS, I can read that book over and over again! It really depends on my mood what I like to read for summer – recently I have wanted to read something really action packed, so I have been reading The Hunger Games trilogy, but I know that after finishing with that I will probably look for a contemporary story. The lunar chronicles are a most recent read. Awesome giveaway!! I'm doing a summer mermaid reading challenge right now. My favorite read so far has been Jackson Pearce's Fathomless. Amazing book! P.S. I tried to follow your blog via Bloglovin' but can't find the button. This is such a cool idea! I love to read and getting books, the best!